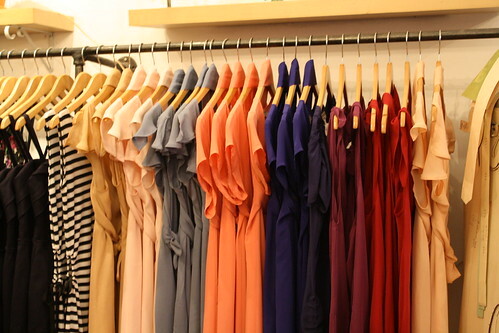 Sally Lauckner A selection of dresses at Anna, 150 East Third Street. It may be all about flirty dresses, loose tanks and bright colors uptown at Lincoln Center, which is hosting Spring 2011 Fashion Week (for the first time ever), but the East Village has both sartorial feet planted firmly in fall boots. Over on Ninth Street — the Museum Mile of boutiques — woolen knits, military coats and lace-up ankle booties are reigning supreme this season. Here’s a compilation of the best fall looks from some of the neighborhood’s most iconic boutiques, whether your style is retro, trendy or refined. Cloak & Dagger Owner and designer Brookelynn Starnes put her Pratt degree to good use when she launched Cloak & Dagger in 2006. The flattering, feminine line which has an old-world meets modern-day feel is chockfull of potential investment pieces. A navy, double-breasted wool coat ($600) with a nipped waist and gold buttons channels the season’s military trend that dominated runways from Burberry to Ruffian, but will never truly go out of style. An impressive collection of vintage Ferragamo riding boots are a find for $298. Meg Canadian owner-designer Meghan Kinney, who opened her East Village store 15 years ago, generally eschews fads in favor of versatility and ease. The few trendy pieces in her collections also pass as classics with their luxurious materials and beautiful cuts. Grey harem pants ($210) can be toned down with a matching cropped jacket ($230.) Store worker Maria Gagnon explained that the functional clothing can take the wearer from “the office, to a bar, to a birthday party.” For fall Meg also has shearling-lined, Doc Marten-inspired booties ($125) that are reminiscent of ankle boots from Miu Miu and Rachel Roy. SALLY LAUCKNER Shoes at Duo, 337 East Ninth Street. Duo Sisters LaRae and Wendy Kangas’ shabby-chic aesthetic influences every inch of the appropriately-named Duo. The narrow store is a blend of carefully-edited vintage pieces dating back as far as the 19th century, and modern clothing from independent and emerging designers. A vintage graphic-print wool cape ($155) combines two of fall’s biggest runway trends: Nordic knitwear seen at Rag & Bone and capes shown at Philip Lim and Marc Jacobs. 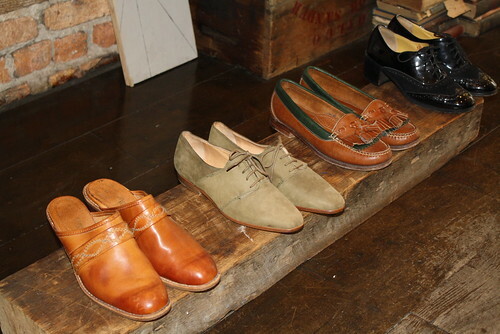 The store is also well-stocked with brown oxfords and black ankle boots. The Keller ‘Shelley’ bootie, currently on sale for $195, is another on-trend autumn pick. Think Closet The quintessential, downtown hipster store, Think Closet, is all about vibrant and eclectic prints for the fall. Jumpsuits and dresses in colorful florals, as seen at Thakoon and Proenza Schouler, and animal prints as shown at Gucci, are right on-trend. A long-sleeved, vintage-inspired watercolor dress ($139) is a funky fall pick. Owner Wendy Chun sources all the clothing and the store is currently stocked by four Korean and two Japanese designers. Anna Specializing in offbeat basics, owner and designer Kathy Kemp adds new stock to her boutique every week. The store is currently packed with whimsical lace miniskirts and dresses, as seen at Dolce and Gabbana and Christopher Kane, but store worker Kimberle Bibb explained that Kemp has been making the cream lace sheaths ($210) for years. Another customer favorite is their convertible, seven-way dress ($250) that comes in several colors and can be turned into a halter dress, a trendy one-shoulder or a sultry V-neck, among other options.